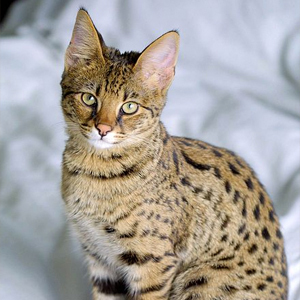 Savannah cat is the name given to the offspring of a domestic cat and a serval�a medium-sized, large-eared wild African cat. The unusual cross became popular among breeders at the end of the 20th century, and in 2001 the International Cat Association accepted it as a new registered breed. Savannahs are much more social than typical domestic cats, and they are often compared to dogs in their loyalty. They can be trained to walk on a leash and even taught to play fetch. Savannah cats are one of the larger breeds of domesticated cats. The savannah's tall and slim build gives the appearance of greater size than their actual weight.